This addon will notify your party/instance members of your quest progression. Quest Accept, Quest Objective Updated, Quest Handed In, Quest Abandoned, Quest Failed. /qs to bring up configuration screen. Edit: So, I've looked further into this, and it appears there's no sure-fire way of achieving this.. I can trap the changes to QuestState_Achieved in QuestObjectiveUpdated, but a lot of the time, killing all the things won't trigger the change to queststate_achieved because there's a second part that says to talk to the handin person :/. If you want, I will do a separate build with this functionality, and you can give it a shot, the feedback would be appreciated :o). Let me know. 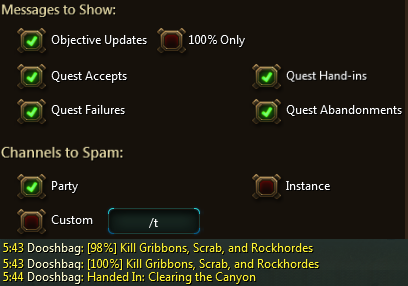 Suggestion: Maybe an option to just have it say when quest completed? Instead of objectives completed.